Born in the town of Feurs, not far from St Etienne, Montagny grew up in the years when local hero Alain Prost was becoming a big name in Formula 1.Montgany started karting at the age of 10 and was a French national champion at 14. In 1994 he moved into cars with the "La Filiere" scheme and he won the Formula Renault Campus series and so graduated to Formula Renault. He was fourth in his first season but in the second he suffered a serious setback when an accident left him with two broken ankles and damage to three vertebrae. He spent some months in the Pitie Salpetriere Hospital in Paris and in 1997 was ready to race in Formula 3. He finished fourth in the series in the first year and second in 1998 and then moved on to Formula 3000 driving for DAMS and then with the Gauloises Junior team, an offshoot of Prost Grand Prix. With no results Montagny had to go to Spain to rebuild his career, racing for the Epsilon by Graff team in the World Series by Nissan and won 8 races and beat Tomas Scheckter to the championship. He changed teams for 2002 to Racing Engineering, but was beaten into second place in the championship by Ricardo Zonta. In 2003 he switched to Gabord Competicion and won the title for a second time. 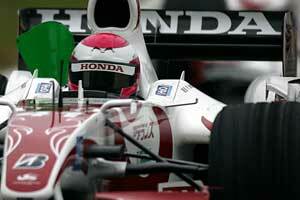 By then he had been taken on as a Renault F1 test driver and he stayed in that role in 2004 and 2005. At the Nurburgring in 2005 he was the third driver for Jordan but decided to look to America in 2006 and tested with PKV Racing. He did not get that drive and so settled in the role as third driver with Super Aguri F1 and was fortunate that Yuji Ide had his licence taken away soon afterwards and so Montagny raced for Super Aguri, beginning at the Nurburgring.He was later replaced by Sakon Yamamoto and so signed with Toyota to be its test driver in 2007.